What Are The Best Online Bachelor's in Aeronautics/Aviation Programs? What Else Can I Expect From an Online Bachelor's in Aeronautics/Aviation Program? If you're looking for a challenging and adventurous career in the aerospace industry, a bachelor's degree in aviation is an excellent choice. Aviation is a multidisciplinary field that includes air traffic control, airport management, aeronautic engineering, and leading edge technology systems, such as unmanned aircraft drone systems. The U.S. Bureau of Labor Statistics projects a 5% growth in jobs for airline and commercial pilots through 2024, and an online aviation degree expands your career prospects. To help you make an informed decision, read on for our guide to bachelor's programs in the field. All bachelor's programs in aviation and aeronautics cover the basics of airport operations, including aviation safety and security, aviation law, air traffic control, aircraft design, and meteorology. The right program for you should feature a concentration or focus that is aligned with your career goals. Some of the popular concentrations include aviation management (flying or non-flying), professional pilot studies, air traffic management, and aeronautics. If your goal is to become an airline or commercial pilot, consider a program approved by the Federal Aviation Administration (FAA) to shorten the required flight training hours. For careers in aviation management, flight training is not required, but some schools encourage students to obtain a private pilot certificate. If your interest is in aeronautics, aircraft design, or engineering, a concentration in aerospace engineering can lead to prestigious and lucrative careers in government or defense agencies. Another popular specialization is unmanned aerial systems (UAS), an emerging aviation technology field strictly regulated by the FAA. Schools offering this concentration give you the opportunity to design, build, and test a UAS application for your senior capstone project. LeTourneau University is the only university in Texas to offer aviation-related education programs. LETU is an interdenominational Christian university that serves 2,700 students around the world. Its aviation and aeronautical science department offers two accelerated bachelor’s of science degrees online: aviation studies and aviation management. The 120-credit aviation studies degree is well-suited for military service members, transfer students, and distance learners with prior aviation experience; LETU makes it easy for students to apply previous credit or experience to earn their online aviation degree. The management-focused curriculum includes classes in aviation safety factors, financial analysis, and business ethics. Courses take three to seven weeks to complete, and most students take one class at a time. The aviation management major allows for more customization. Mechanically-inclined students can opt to take a maintenance concentration, which covers topics such as human factors, aviation safety, and transportation systems. Students in this specialization track can receive 30 credits if they have A&P mechanic certificates or 15 credits for either airframe or powerplant certification. Embry-Riddle is the largest university in the country that specializes in aviation and aerospace. Its worldwide campus offers a fully-online bachelor’s of science in aeronautics with 12 terms throughout the year. Classes are divided into nine-week sessions. The 120-credit curriculum consists of two parts: program support, which includes courses such as financial accounting, aviation legislation, and statistics, and a professional development core that contains aerodynamics, aviation safety, and a capstone project. Students can earn more than one quarter of their credits based on prior experiences, allowing distance learners to earn their aeronautic aviation degree in as few as three years. Degree candidates can further strengthen their credentials by participating in co-ops and internships with airline and aviation companies or by pursuing a minor. Aeronautics students who wish to accelerate their path to a graduate degree may also qualify for ERAU's four-plus-one program, where they can earn a bachelor's and master's in five years. Liberty University, located in Lynchburg, Virginia, is the largest nonprofit Christian university in the world. LU also has the largest flight school in Virginia and boasts a relatively low tuition rate. LU offers an aviation bachelor’s degree online through its virtual campus, which enrolls about 86% of LU's student population. The program is 120 hours in total, and distance learners can transfer in up to 90 credit hours. The program's curriculum is comprised of major-related coursework, including classes in instrument flight, aviation weather, and turbine engines and jet transport, in addition to general education and major foundational courses. Classes are arranged in eight-week sessions. Although LU provides its self-paced coursework online, distance learners have the option to participate in the school's flight training affiliate program. Students can complete flight training at a convenient location and earn their degree in just 2.5 years. One of the nation’s top historically-black schools, Hampton University offers a bachelor’s of science in aviation management that specializes in airport administration. This degree can be earned online and prepares students for airport managerial careers. The 122-credit hour program is the only one at any of the United States’ 105 historically-black universities that has been approved by the Federal Aviation Administration. Courses in HU's online aviation degree are based on both business-related topics and technical training in aviation, encompassing a wide variety of classes from crew resource management and unmanned aircraft systems to statistical analysis and organizational behavior. HU also offers distance learners flexible, 24/7 support services. As part of the application process, students must write a short essay detailing their 10-year goals, although applicants with previous college credit in written communications are exempt from this requirement. Students can also transfer up to 30 credits into this program. Central Washington University is the fastest-growing public, four-year university in the state of Washington. It also hosts one of the state's most popular online learning programs. CWU offers a waiver to nontraditional, out-of-state students, allowing them to pay the same tuition as resident students when they enroll in a fully-online program. Most of the online college's bachelor's degree-completion programs, including its aviation management program, do not have any on-campus components. Coursework in this aviation bachelor’s degree program centers on developing administrative and management capabilities. Core courses consist of aviation law, threat and error management, and airport operations. Students can select between a general aviation management specialization, which covers subjects such as leadership, international aviation management, and airport planning and design, or the program’s aviation maintenance management track. Eastern New Mexico University, located in Portales, is the largest regional, comprehensive university in New Mexico. The school's bachelor’s in aviation science is one of its newest programs, but it has already become one of the top-10 most popular undergraduate majors. This program, which can be completed entirely online, has two options: a bachelor’s of science track and a bachelor’s of applied arts and science track. The BS offers advanced levels of study as part of a liberal arts program and is aimed at aviation-related professionals seeking higher-level positions. Alternatively, the BAAS is better-suited for degree candidates with extensive field experience in aviation who hold either 30 semester hours of aviation-related credits or an FAA certificate. Both tracks share the same core curriculum, including courses in aviation history, flight theory, FAA regulations, and law; students must complete a minimum of 120 hours. However, the BAAS distinguishes itself by its more technical emphasis. The majority of students enrolled at Everglades University pursue their degrees through its online division. Many of EU’s programs are offered remotely, including a bachelor’s of science in aviation/aerospace, and distance learners have access to extensive online support through Smarthinking tutoring and a 24/7 online library. The online aviation degree at Everglades incorporates both aviation-specific and management coursework into its curriculum. Students also choose from a variety of concentration areas, including aviation safety, flight operations, management, aviation maintenance management, aviation operations management, or security. Students complete a minimum of 123 credits in general education, interdisciplinary studies, and major-related courses. The program also culminates in a capstone project. Major-related coursework includes aerodynamics, flight school management, and introduction to space. The degree generally takes 41 months to complete, but students can transfer in credits to finish faster. The Florida Institute of Technology, located in the city of Melbourne, is the only independent, technological university in the region. The majority of its students focus their studies on engineering and the sciences, with the field of aviation being one of the school's key emphases. Florida Tech's online bachelor’s of arts in aviation management is structured in eight-week sessions. The curriculum consists of 41 classes totaling 121 credits, and most students complete the program in four years. Coursework includes aviation business simulation, the National Airspace System, and aviation planning. Students also partake in business-related courses such as marketing and macroeconomics. The bachelor's degree in aviation has six start dates per year and there is no fee to submit an application. All distance learners pay the same tuition rate, regardless of their state of residency. Vaughn College of Aeronautics and Technology is a specialized aviation and engineering college located in Flushing, New York. 98% of its graduates find employment or continue their education within a year. Vaughn College offers five aviation-related programs that can be completed entirely online, including two flexible, self-paced bachelor's degrees in aviation maintenance and aviation maintenance management. The curricula for both of these programs incorporate advanced training in maintenance technology and a foundation in arts and sciences. However, aviation maintenance management students take more major-related credits (43 rather than 34) and fewer arts and sciences classes. The aviation maintenance curriculum covers aircraft systems, avionics, and rotorcraft design technology, while the management track focuses on topics like business communications, organizational behavior, and financial management. The class schedule for distance learners follows the same format that is used on campus: 16-week terms with two six-week summer sessions. Distance learners pay the same rate as traditional students, regardless of their location. Located in Boca Raton, Florida, Lynn University serves an international student body of over 2,800 students. Lynn emphasizes a time- and money-saving approach to online education; the school recently introduced a new iPad-powered online learning program with accelerated terms and reduced its online tuition by nearly 20%. Students enrolled in Lynn’s online bachelor’s of science in aviation management typically take six credits at a time over a series of eight- or seven-week terms. The curriculum includes business courses, aviation electives, and the core university curriculum. Students can study aircrew training, air industry management, aviation technologies, and global aviation law, while elective courses provide the opportunity to engage in hands-on flight training. 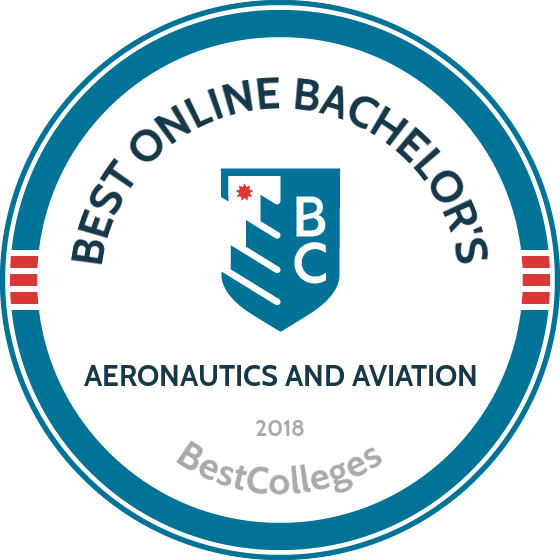 The bachelor’s in aviation science and management totals 120 credits; however, Lynn awards credit based on previous experiences and achievements, including a professional experience portfolio that can cover up to 25% of the degree requirements. While program requirements differ among schools, you can expect a strong focus on aeronautical decision-making and problem-solving skills. Courses such as flight theory, air traffic control, security, and aviation law are completed by all aviation majors. Here's a general overview of what to expect in an aviation bachelor's program. Below is a sampling of courses offered by most aviation bachelor degree programs. While course titles vary by school chosen, some material is foundational for all aviation students. Flight physiology: This course explores human physiological responses to stressors in flight environments, which prepares students for careers as commercial pilots or certified flight instructors. Topics include fatigue, acceleration, decompression, hypoxia, pressure alterations, and spatial disorientation. Students participate in lab simulations of altered pressure environments in an altitude chamber. Air traffic control: By simulating the role of an air traffic controller in a terminal radar approach control environment, students gain experience in air traffic management. Topics include surveillance, navigation subsystem technology, collision avoidance systems, and sequencing in the terminal area. Students learn realistic, hands-on experience managing landings at civilian and military airports. Aviation law: This course covers the basic legal framework of aviation law through case reading, legal research, and argument. Topics include aviation operations, aviation accident litigation, state and federal tort law, constitutional law, criminal law, administrative law, federal statutes and enforcement actions, aircraft ownership issues, contract law, and international treaties. Aviation meteorology: Students interpret and measure meteorological elements and their effect on aircraft performance. Topics include stability, temperature, pressure, clouds, fronts, air masses, atmospheric heat exchange, thunderstorms, aviation weather equipment, meteorological flight planning, and weather forecasting with specific application to flight. Aviation safety: An introduction to aviation safety for those aspiring to commercial airline flight. Topics include aviation safety culture, risk management, disaster and emergency planning, pilot psychology and physiology, human performance, internal reporting systems, and accident investigation. Students participate in classroom exercises that introduce the techniques and tools of safety promotion. HOW LONG DOES IT TAKE TO GET AN ONLINE BACHELOR'S IN AERONAUTICS/AVIATION? Most bachelor in aviation science programs are completed in three to four years and require 120 credits. If you have transfer credits, or certifications and ratings from the military or FAA, you may qualify for advanced standing, which considerably shortens your completion time. A program's structure will also influence the length of your degree. Some programs are offered in a cohort model, where students progress through a fixed course of study together, enjoy increased peer support, and graduate as a group. If you prefer to complete coursework at your own pace, select a program that offers individually paced learning. Some schools also offer exceptional students an accelerated track, which may eventually lead to a master's degree. For pilot career paths, you should factor in flight time requirements. If you graduate with a bachelor's degree from an FAA-approved school, fewer hours of flight training are required for pilot licensing. Accreditation is an official review process handled by regional and national agencies to ensure a school's adherence to rigorous quality standards. You should look for three types of accreditation: regional, national, and field-specific. Regional accreditation is the most widely held and respected designation; it is awarded to schools that meet standards for their state and region. National accreditation requirements are less standardized, and typically apply to vocational and technical schools featuring for-profit status or religious affiliations. Online programs undergo peer reviews by the Distance Education Accrediting Commission to ensure they meet national quality standards. For field-specific accreditation, look for a stamp of approval from the Aviation Accreditation Board International (AABI), which ensures that aviation programs meet stringent industry standards for relevance, improvement, and quality. Uniform standards of accreditation are made possible by the oversight of two organizations: the U.S. Department of Education (DOE) and the Council for Higher Education Accreditation (CHEA). The DOE does not accredit schools itself, but recognizes accrediting agencies. The CHEA approves agencies that award national accreditation, and provides assurance of academic integrity. Before you decide on an online aviation degree program, you should verify that it is recognized by the DOE, the CHEA, and the AABI. This ensures that you are eligible for financial aid and receive the best education available. It's also wise to verify that the accrediting agency itself is qualified to evaluate schools properly. To see a comprehensive list of accredited schools and programs, visit the DOE and CHEA websites. A bachelor's degree in aeronautics/aviation gives you an advantage in career prospects, salary outlook, and job placement. According to a recent report by the Georgetown Center on Education and the Workforce, a bachelor's degree leads to increased lifetime earnings in the aviation and aeronautics field as a whole. For example, helicopter pilots do not traditionally require a bachelor's degree. However, a 2014 report from Embry-Riddle Aeronautical University's scholarly commons concludes that as helicopter companies continue to expand, employers are increasingly favoring candidates with bachelor's degrees. For airline and commercial pilots with bachelor's degrees, the BLS projects a five percent increase in available jobs over the next decade. Salaries for graduates of bachelor's in aviation science programs vary depending on location, employer, and level of experience. Aerospace engineers and air traffic controllers have the highest median salaries at all stages of their careers. Commercial pilot salaries in later career stages can match or exceed those of aerospace engineers and air traffic controllers. Using data from PayScale, the table below provides expected median salaries for aerospace engineers, commercial pilots, and other aviation staff at various stages of their careers. While many online aviation degree holders pursue careers as airline pilots, graduates can find employment opportunities in aviation management, military services, aircraft manufacturing, unmanned aircraft systems, and flight simulator companies. Employers typically prefer to hire reliable candidates with strong teamwork and decision-making skills who are able to work under pressure. Interpersonal communication skills and accurate, organized record-keeping habits are also important. Here's a brief look at a few potential career paths for aviation graduates. Airline pilots operate controls and engines to navigate and fly planes that transport people and cargo. Commercial pilots fly aircraft for other purposes, including fire fighting, rescue operations, agricultural irrigation, and charter flights. Major airlines typically require a bachelor's degree from a program approved by the FAA. Air traffic controllers monitor weather conditions and other factors to ensure that aircraft remain at safe distances from one another during flight and ground movement. A bachelor's degree from an FAA-approved program and a favorable score on an aptitude test are usually required for employment. Aircraft and avionics equipment mechanics and technicians maintain and repair aircraft, and perform inspections when required by the FAA. While an associate degree can provide entry into the field, some employers also require airframe or powerplant certifications, and a bachelor's degree can provide hiring advantage. Aerospace engineers design, build, and test aircraft, missiles, spacecraft, and satellites. A bachelor's degree from a program accredited by the Accreditation Board for Engineering and Technology is required for all entry-level jobs. Aerospace engineering and operations technicians install, operate, maintain, and test equipment used in development and production of aircraft and spacecraft. They also calibrate aircraft computer systems and perform quality checks. While a bachelor's degree is not required for entry-level employment, FAA certification and continuing education can provide a career boost. As a future aviation professional, it's worth your time to look closely at the many valuable membership benefits available through professional organizations. You can take advantage of members-only scholarship programs, networking opportunities, annual conferences, discounts on travel expenses, research assistance, and resources for continuing professional development. Some organizations also provide policy advocacy and member representation in governmental proceedings, and participate in the accreditation process. The oldest national aviation club in the U.S., the NAA advances the art, sport, and science of aviation. They also host aviation awards ceremonies, and offer member discounts on travel expenses and sporting licenses. Founded in 1939, the AOPA is the largest aviation community in the world, and more than half of all U.S. pilots are members. AOPA provides training resources, a speakers bureau, and advocacy services. Founded in 1996, AWAM supports women in aviation maintenance technology with networking opportunities, mentoring, professional development resources, an annual conference, and a scholarship and awards program. Representing airport management personnel since its founding in 1928, AAAE supports airport executives as they fulfill responsibilities to airports and communities. Member benefits include training, meetings, conferences, and an accreditation program. Founded in 1919, the AIA is a trade association representing the business interests of the U.S. aerospace and defense industry. Member benefits include international air shows, networking opportunities, a bi-annual meeting, and research assistance. College costs can seem daunting, but fortunately there are many sources of aid available. For access to grants, loans, and other funding offered through the U.S. government, complete a FAFSA (Free Application for Federal Student Aid) form. Loans and scholarships are also available through professional aviation organizations such as AOPA. For programs requiring flight training, consider the additional costs of flight time. Many students receive their initial flight training in the military, and attend schools offering tuition discounts to military personnel.